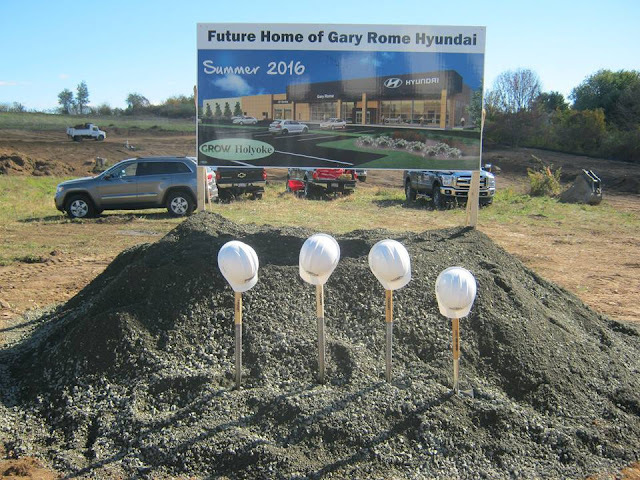 Official groundbreaking ceremony of the new Gary Rome Hyundai dealership at 150 Whiting Farms Rd, Holyoke, MA. HOLYOKE, Mass. (WWLP) – Gary Rome Hyundai held a ribbon-cutting ceremony Friday at their planned dealership on Whiting Farms Road in Holyoke. The groundbreaking comes after months of negotiations with neighbors, and the approval of a zone change. The site was at one point considered as a potential location for a Walmart store, but those plans were later dropped. Now that construction is underway, 22News wanted to know how Gary Rome plans to compete with other dealerships. He said that his new building will be unique due to its energy efficiency. They will only use reclaimed and recycled water, and electric car owners will be able to recharge their vehicles there for free. Rome told 22News these aspects will set him apart from the competition. “We’re always concerned about competition, but we think with this new dealership, it’s going to be eco-friendly and state-of-the-art. I think it will really give us a good advantage,” Rome said. He told 22News that the dealership will increase the city’s property tax revenues by thousands of dollars. They are also hiring 50 new full-time and 20 new part-time employees. The new dealership is expected to open next August. Gary Rome Hyundai is currently located on Main Street in Holyoke.